Get ready for #GivingTuesday on Dec. 3! We have one day for giving thanks and several days dedicated to retail shopping, but what about giving back to deserving causes? #GivingTuesday is "a call to action to celebrate giving and encourage better, smarter and more giving during the holiday season." On Dec. 3 people around the world are enouraged to give back by donating their time or making donation to the causes near and dear to them. Founded by the United Nations Foundation and New York's 92nd Street Y, #GivingTuesday celebrated its inaugural year in 2012 and Columbia College was one of its first participants. 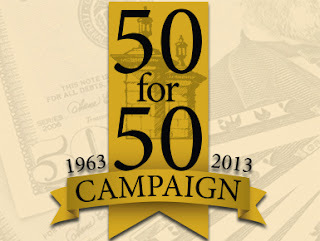 This year the college is partnering with the Columbia College Alumni Association to raise funds for the 50 for 50 campaign. In honor of CCAA's 50th anniversary, the association is endowing a scholarship, which will award two scholarships annually to current students. As you plan for this holiday, we ask you to consider in #GivingTuesday and to donate to the 50 for 50 campaign. Tuesday, November 05, 2013 Chk out- Get ready for #GivingTuesday on Dec. 3!